The concluding work of art of the Violeta Violeta trilogy is finally out and has caused chaos in the civilized world. Why? Because this album is so grandiose and spectacular that the fans from the early beginning may start to doubt their position to Norway’s musical treasure. The oil drums, crowbars, work-gloves and intimidating guitar solos have been replaced with a 64-man symphony orchestra and bow ties. Who could ever believe that happen in 2001? This album is truly… something. The extravagance makes it extra hard to determine exactly what this is, and it will take time before it is digested. But isn’t this exactly what Kaizers Orchestra wanted? The Norwegian sextet will be taking a long break starting next year, with a promise of a return and a musical, they are leaving the fans with something to chew on. Like a chocolate cake that only gets better with the days. Or like expensive wine, which is a better comparison to this highly artistic and innovative group of men. The album starts with an explosion and a funeral. We‘re talking about Begravelsespolka (the funeral polka). A song clearly sung by The Devil himself, warning Violeta about her mothers actions. The song gives a distinct presentation of the craziness we will encounter during the next hour of our life, as the total playtime is about an hour (20 minutes longer than the two previous albums with the same amount of songs). And just when you thought they couldn’t get crazier. Just wait. It will. As the song is very powerful, you might get worried about the rest of the album the first time you hear it. You don‘t really know what to expect as the two previous albums in the trilogy start with more relaxed and slow songs, building up mood, tension and atmosphere as you listen. Begravelsespolka contains several elements of a Broadway musical as it contains a symphony orchestra (Stavanger Symfoniorkester – SSO), Janove doing strange things with his voice, a monologue and the Kaizer-elements we are already familiar with. When you hear it, you’ll know just what I mean. The explosion is followed up with some calmed tension in Forloveren (best man/maid of honor – also means the promisor). This song brings us to more romantic regions of our mind. It sounds like a tragic romance, but then when you listen to the lyrics, you kind of don‘t really know what you’re dealing with. The Kaizer-elements are mixed with pop music and the devil proclaiming his presence. Check out the chorus of this song. You might end up hearing it again sometime. Aldri Vodka Violeta is all about Violeta never drinking Vodka, the venom that ruined her mother. Especially not when she is bubbly inside. And we‘re not talking about the cheerful bubbly that Colbie Caillat beautifully portraits in her song. This was the primary single released from the album, having an objective of portraying an image of the entire album. Violeta is getting older and starting to ask questions, and these can be heard sung beautifully by Janove Ottesen, the front guy of the band. Also known as The Jackal. The band hit an immense bang on the big drum on the song Tvilling (twin). It is one of the most beautiful, yet funky song I have ever heard by the oil-drum molesting band from the west. The lyrics are beautiful; Janove’s voice is beautiful (it can get very not-so-beautiful in some songs); while the ending is the most beautiful part of the song. I believe this song is beautiful and something else than what I would expect from them. Wow, that‘s a lot of beauty in there, still it isn‘t THAT beautiful. And it is still very Kaizers Orchestra. How do they do that? 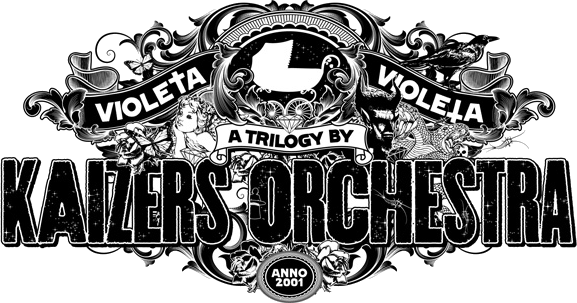 The following song is probably the most Kaizers Orchestra song in the entire album. It is one of my very favorites and it reminds me of their earlier days, with an immense improvement on all possible areas. Det Polaroide Liv, the Polaroid life is a gypsy-rock type of song with a message from Kenneth to Beatrice. He asks the question: what have you done for us? And man, this is really something! It made me smile the first time I heard it and the smiles keep coming on a rolling basis, despite the not-so-happy theme of the song. And then we have Siste Dans – the last dance. The devil himself asks Violeta to dance with him in order to reach Beatrice. This is the second single released from the album, and I define it in the genre Kaizerpop. This song is 100 % listenable at any preferred moment of the day, in any situation, it has a function of cheering you up and it may even make you smile. Someone has picked a six-leaf clover on this one. Markedet bestemmer – the market decides. Well I couldn’t make a clear decision about this one, and I am a part of their market. Seriously, what is this? This is the weirdest, yet most beautiful song I‘ve heard by the band. The first minutes are just absurd with Arabic inspiration. The second part of the song is just beautiful and you really start appreciating the lead singers talent. This definitely carried an element of surprise, so congratulations, you did it; you knocked me off my chair. Do you have Satan in you throat? I certainly hope not. Satan i halsen starts out similarly as Begravelsespolka, but man are these songs different. The chills ran down my back as the song went on. There are 3 different voices; the male choir, the megaphone voice and Satan himself. And of course you have the metal part in there. That causes a serious WTF moment, with the chills duplicating as you listen. This is just absurd. This song and the previous just put me in an involuntary position. At this point, my feelings about the album are very mixed. The craziness is decelerated with a song regarded as the most beautiful song in the album – Perfekt i en drøm (perfect in a dream). The song is indeed beautiful, but it hasn‘t really caught my attention yet. I believe this is a song that needs to be discovered, and rediscovered. Something I believe will happen in a couple of months from now. A lot of things are happening in this song, and when you realize that you‘ve heard some of the lyrics before, you might start smiling. The album is concluded with the most remarkable, outstanding, grandiose and incredible piece ever heard – Sekskløver – six-leaf clover. The intro reminds us slightly about the harsh, yet calm days of Die Polizei, while the song itself sums up the voyage encountered in the album and the entire trilogy. If ever-in doubt is it is possible to fall in love with a song, this song made the possibility evident. The tears were on their way the first time I heard this song, and the exquisiteness of it keeps growing on me. Janove Ottesen really shows off his singing talent in this song, where the roughness is all gone and replaced by smooth and calm notes. This is the grand masterpiece that proves just why the band has deserved a long break. At the end of the song we can also envision the final scene of the musical that is in the making. After actually putting my opinions to paper, I can finally conclude that this album is a grand masterpiece, not because the songs are prodigious, but because they will take time to sink in. I have to repeat myself – who would ever have though the Ompa-rock band would have ended up here? I know for sure that I will be looking for six-leaf clovers than dancing Ompa till I die. Kaizers Orchestra has not only created a new distant universe, but a world we can almost touch through a mind-blowing trilogy with exacerbating elements in the story through every album. We will be sharing a secret, which is the dream of seeing the musical one day. Congratulations and a standing ovation is in order for an impeccable album, trilogy, career and story for these guys. The break is well-deserved, after I have seen them in concert of course!